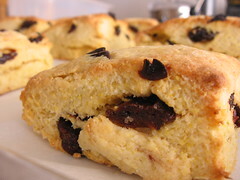 Lemon Cornmeal Scones with Dried Cherries - Do You Know The Muffin Man? Notes: Just before I finished mixing up the batter, I realized it was quite wet because I forgot... the flour! Whoops. These scones were pretty bland and dry, even though I used half-and-half cream instead of milk. I soaked the cherries in some Kirsch but they were still quite sour. More butter is definitely the way to go.